Clean, polish and protect with one formula! 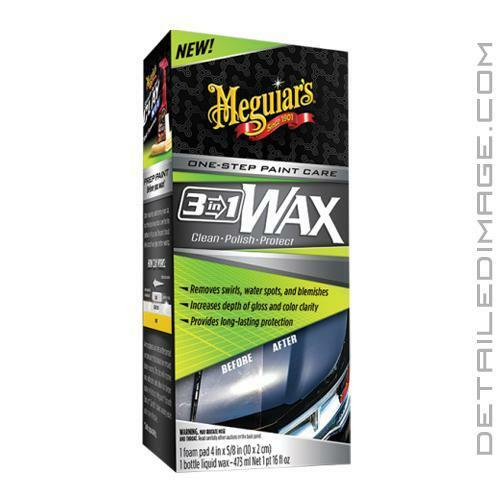 Meguiar's 3-in-1 Wax allows you to clean, polish and protect in one easy to use product! Cleaning, polishing and protecting, when performed individually can take up a lot of time. Life can be busy though and sometimes we simply do not have all the time we need. This is where 3-in-1 comes in handy! This unique formula gently cleans the paint, removes minor defects while delivering an increased depth of color, gloss and shine. Simply apply to a light corrective pad, polish the desired section and wipe away any excess with a clean microfiber towel. Once finished you will also be left with a long-lasting layer of wax protection. 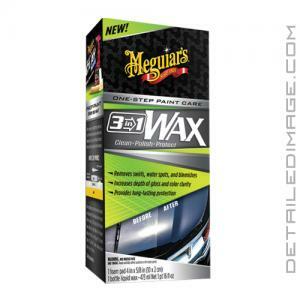 If you are looking to save some valuable detailing time, the Meguiar's 3-in-1 Wax is a great choice! CLEAN: Fine polishing abrasives work to effectively remove swirls, water spots, and other light blemishes in paint. POLISH: Polishing oils rejuvenate paint, to give it more depth of shine while enhancing gloss and color. PROTECT: A rich blend of carnauba and synthetic waxes provide a durable, protective barrier and resilient water beading. Apply a small amount of product onto the included applicator pad and spread over paint in an overlapping, circular motion leaving a thin coat behind. Once wax has dried, remove with a high-quality microfiber towel.